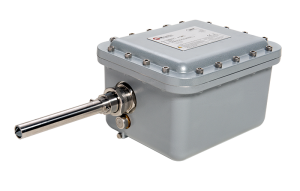 Keit announced receipt of ATEX and IECEx certification for its rugged IRmadillo™ Fourier Transform Infrared (FTIR) spectrometer. Dan Wood, CEO, stated “The certifications assure our clients that our analytical instrument has been rated for use in hazardous environments including potentially explosive ones. This is a requirement for industries such as in Oil & Gas, Petrochemicals and Pharmaceuticals where the processes involve potentially explosive chemicals. The monitoring instruments used in these production processes, like the IRmadillo™ FTIR, have to be proven safe for operating around highly volatile products”. Dan Wood continued “The IRmadillo™ FTIR spectrometer is unlike any other. We knew that it could handle a lot. It is vibration tolerant, compact, tough, and built to function under challenging conditions. It has already received the CE mark for non-hazardous environments and we have planned for North American certification for hazardous environments. However, the ATEX and IECEx certification is accepted globally by many of our target industries operating in challenging environments”. Dan stated “In industrial environments, the toughness of PAT should go hand in hand with its function. It should work, work dependably and work regardless of the environment. We’ve proven with the IRmadillo™, that it can be accomplished with FTIR spectroscopy”. Dan explained “FTIR is an established and powerful technique for the analysis of chemical reactions. FTIR can tell you a lot about what’s going on in your process as it happens — in real time. However, most standard FTIR instruments rely on sensitive moving parts, fibre-optic coupling, and are extremely vulnerable to shock and vibrations which makes them impractical for production environments. Often, manufacturers have to wait for their reaction analysis because they are doing remote sampling and lab analysis”. Click on image to download the IRmadillo technical specification sheet. 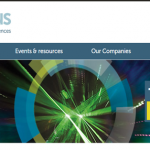 “Most manufacturers are eager for insight into their processes. Sometimes, due to the difficult or messy nature of their operating environment they have to proceed relatively blindly and hope for the best. Our goal is to help those companies get real-time information — as it happens, no matter where. Using a rugged in-line analytical instrument can lead to faster information, better yields, and less waste”. 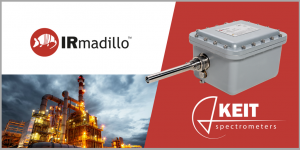 The IRmadillo™ is a rugged FTIR spectrometer that provides real-time reaction analysis for better process monitoring and control in manufacturing environments. A novel and vibration-tolerant analytical instrument, the IRmadillo™ mid-infrared spectrometer is compact, lighter and significantly more robust than existing FTIRs. Unlike any other FTIR, the Keit instrument can be mounted directly onto manufacturing vessels or connected to process lines enabling continuous, real-time reaction analysis of liquids and slurries.